CanDo Coffee is easy enough to find when you know where it is… The simplest way of locating it is via the rear entrance of Paddington station (head towards the District Line in the direction of Ealing/the Hammersmith & City Line in the direction of Hammersmith, but turn right, up the short flight of steps). This will put you on the tow path of the Paddington Basin branch of Regent’s Canal. If you were heading for Beany Green, you’d turn left, but instead, turn right, and, just before the first footbridge crossing the canal, you’ll find CanDo Coffee. There’s not a lot to it, just a black trailer, about the size of Newcastle’s Hatch Coffee, with its back to the bridge, facing a building that spans the canal. This means that you can’t see CanDo Coffee from the rear entrance of the station, but it does create a relatively sheltered spot where CanDo Coffee has placed its two tables, each with a pair of chairs. Right now the view’s not much to look at, but when the building work has finished, it will be a very pleasant, canal-side spot. I know that CanDo Coffee has plans for more permanent seating, and despite the drawbacks, it’s still a wonderfully secluded place to have your coffee. A word about CanDo Coffee tself. 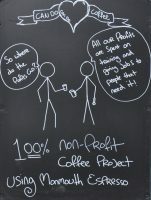 Although its mission is best described on the CanDo Coffee website, it’s basically a not-for-profit social enterprise, getting disadvantaged and socially-excluded people back into the workforce by training them and giving them meaningful work (in this case, running coffee carts/stalls). So, to the coffee. CanDo Coffee uses old hands, Monmouth, with an espresso blend consisting of beans from Brazil, Colombia and Guatemala. I tried it as a straight espresso (the usual milk options were also available) and was impressed, both with the skill with which my barista, Matt, made it, and with the coffee itself. It had good body and a complex, rich flavour. Had I not just left Beany Green and been on my way to Modern Society, I’d have been tempted to see how it went in milk. One word of caution: CanDo Coffee only has takeaway cups, so please do bring your own. I had my espresso in my Kaffeeform cup. Made of recycled coffee grounds, I now carry it with me everywhere I go for just these situations! December 2016: CanDo Coffee was a runner-up for the 2016 Best Takeway Coffee Award. This entry was posted in Breakfast, Cake, Coffee Carts/Stalls, Coffee Terraces, Saturday Short, Stations Nearby, Takeaway, West London and tagged Electric, include, Monmouth by Brian Williams. Bookmark the permalink. I know exactly what you mean! But it is definitely worth popping in every now and then as a change.